This tree was measured as the best of four trees at the site (Hart 1989). John Conroy built Maungawhare in 1878 for Henry Stainforth Brabant (1844-1926), the brother of Herbert William Brabant Resident Magistrate and Commissioner of Lands in early Tauranga. Brabant first named the house Woodhill, later using the same name at his second house, still known as Woodhill at 167 Grange Road. 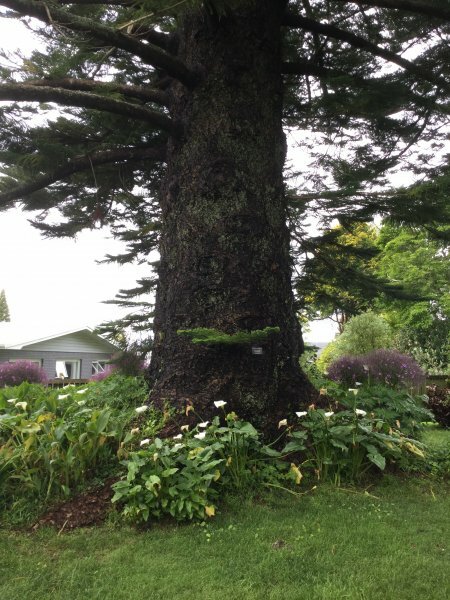 Henry Brabant chaired the Tauranga Horticultural Society and his interest in trees can be seen in the magnificent plantings in the garden (Tauranga Historical Soc.). This property was part of a larger estate but now only the homestead and several fine trees are left (Ferkins 1993). Burstall SW & Sale EV. 'Great Trees of New Zealand' 1984; p.106. 01 Jan 1989 Hart, R.W. Northeast of the homestead. The property is privately owned but open to the public.